The two parties are also planning a similar tie-up in Rajasthan and Chhattisgarh. In a historic first, the Congress party will have an electoral pact with Mayawati’s Bahujan Samaj Party (BSP) in the upcoming Madhya Pradesh polls. The Congress and BSP are also planning a similar tie-up in Rajasthan and Chhattisgarh. Kamal Nath, the newly-appointed Congress chief for MP, confirmed this to The Wire and said he was the one negotiating with Mayawati. 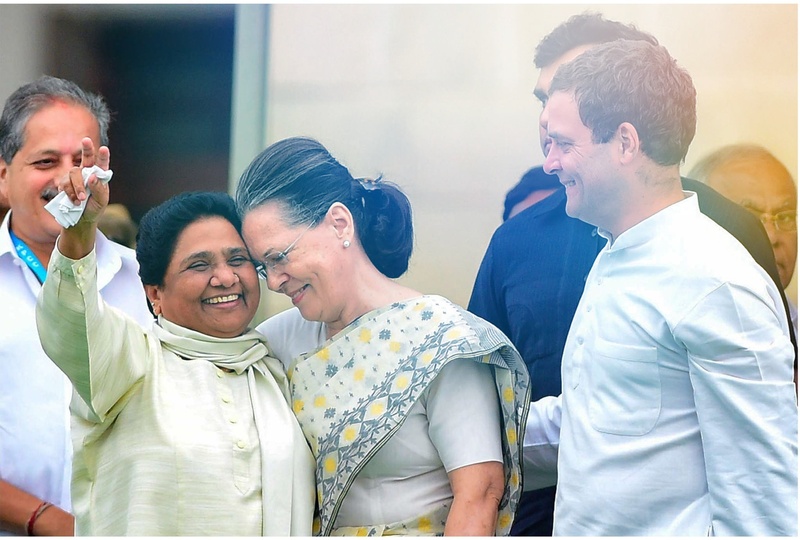 The alliance with BSP is done and dusted in principle and the Congress has already got the Gondwana Gantantra Party – which has a tiny hold in eastern MP – on board with the alliance. For the past 20 years, Mayawati has polled a steady 7% vote share across Madhya Pradesh. If you add the Congress vote share in the last elections – 37% – then the Congress and BSP alliance is likely to give the BJP a jolt. The BJP polled 45% of the votes and is facing huge anti-incumbency in MP after being in power for three terms. A recent Lokniti-CSDS survey suggests that anti-incumbency in MP is much worse than in Rajasthan. The MP alliance, sources say, is a precursor to a wider alliance with BSP in Rajasthan and Chhattisgarh, where the BSP polls a similar vote share. The significance of the Congress outreach to Mayawati cannot be underestimated for a united opposition to take on the saffron party in 2019. Both parties have had to shed a lot of baggage to get to this point. The Congress its big-brother attitude and reluctance to shed any political space in the states which are still a bipolar polity, and Mayawati her traditional reluctance to ally with any party as she believes that while her vote base gets transferred, the BSP does not enjoy similar gains with allies. Kamal Nath is exploring two options in his meetings with Mayawati – one, a traditional pre-poll alliance and the other, a tactical understanding which will mean putting up candidates which eat into the BJP’s vote share in every constituency. Kamal Nath, who is in Delhi to complain to the Election Commission about lakhs of fake voters in the MP electoral rolls, told The Wire: “I am talking to Mayawati and we are confident that we will come to an agreement. The Shivraj government in MP and the Modi government in the Centre is a disaster for the people of the country and the Congress is committed to the project of a united opposition to take them on”. The Mayawati-Congress alliance initiative, initially for MP and later for two other states, will also showcase the growing united opposition and get the fence-sitting leaders of the opposition to take a stand. Sources say Congress president Rahul Gandhi has given Kamal Nath a free hand to negotiate with Mayawati and the only brief is to get the alliance done and dusted. Rahul wants to act as a catalyst of opposition unity much as he earlier did in Gujarat, where he got disparate opposing community leaders Jignesh Mevani and Patidar leader Hardik Patel on a common platform to oppose the BJP. The Congress’s commitment to act as a lynchpin of opposition unity was on show when it announced an alliance for the big fight of 2019 with the Janata Dal in Karnataka, where it has currently formed a coalition government. The coming together of the opposition is making the BJP jittery as it sheds more allies. Amit Shah is using every trick in the book, including the enforcement agencies against regional parties. According to a senior leader, “Huge pressure has been put on Mayawati not to ally with Akhilesh Yadav in UP and now to break up the alliance with the Congress. Yet, she has had enough and is not ready to play ball.” The registration of a CBI case in Air Asia against RLD leader Ajit Singh the night before the results of the Kairana by-polls points to this. The misuse of the CBI and Income Tax department is not helping BJP any longer as opposition leaders are getting emboldened by the broader political sentiment against the ruling party. The Shiv Sena has broken its nearly 30-year-old alliance with the BJP and the Akali Dal is upset with the fuel price hike. After serial snubs, sources say that Nitish Kumar, who was publicly given a put down by Union minister Nitin Gadkari who ruled out special status for Bihar, is making noises. Nitish, who performed a somersault and landed with the NDA, knows that Shah will make no concession to him and the Janata Dal (United) in the Bihar seat-share formula. If forced in a corner by Shah, Nitish may go it alone and work out an understanding with the winner of 2019. The arrogance of the ruling dispensation is not helping Shah keep the opposition disunited anymore. MP, like the Kairana by-poll, will show the way, but a united opposition seems a reality notwithstanding the coercive methods being used by the Modi regime.